Great Alternative to Paper Shredder!!! 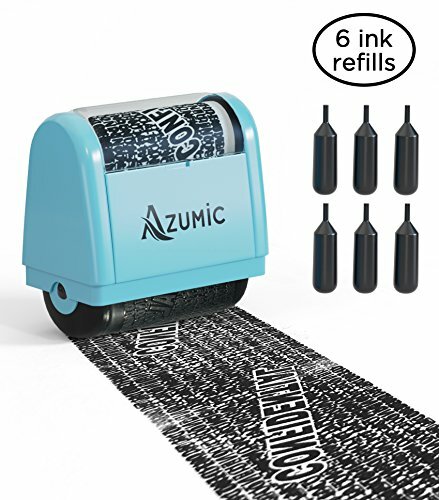 If you hate the annoying loud noise of the paper shredder or the dust of the shredded paper flying everywhere, then this roller stamp is your solution! It is fast, easy, and simple to use. Cut the top of the ink capsule. Fill in the entire capsule on the right side of the stamp. Set horizontal and let the ink sink in for 2-3 minutes. Start swiping until the ink sink in evenly. It is now time to say goodbye to your shredding machine. Add this roller stamp to your Cart Now! ECO-FRIENDLY: The paper can easily be recycling once all personal information had been covered. Now you can lend a helping hand in saving our planet. If you have any questions about this product by Azumic, contact us by completing and submitting the form below. If you are looking for a specif part number, please include it with your message.